My two companies recently came together to host an incredible learning opportunity. 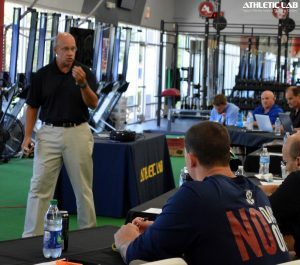 Athletic Lab (my US based sports performance training and research center) and Proformance (the UK based coaches education company that I co-own) put on the High Performance Athletic Development Clinic. There were over 60 coaches in attendance including staff members from the Carolina Hurricanes, NC State, UNC, Duke, UNC, ECU, Clemson, Wake Forest, Ole Miss and more. The featured speaker was legendary Track & Field coach Boo Schexnayder who lectured attendees for over 7 hours over the 2 day clinic. Not to be outdone, the other 9 speakers were also top notch. With many of the speakers having strong field and court sport backgrounds, the information was well-rounded and truly world class. Greg Gatz, for example, has worked with UNC’s famed soccer program and many members of the US National Teams. Here’s a guest blog from 3 attendees (Earl Wilcox, Greg Gustin and Lindsey St. Hilaire), all of whom are part of Athletic Lab’s Coaching & Applied Sport Science Mentorship Program. See the end of the post for short bios on each author. Coach Schexnayder opened the weekend clinic by laying a foundation of information regarding program design. He starts by stressing that the adaptation an athlete obtains is dependent upon the stimulus given, and may occur without visible evidence of it. Because of this, we need to send specific and extremely clear ‘messages’ to the body all the way down to the cellular level. To accomplish this, Boo starts by grouping his training into either high or low neuromuscular stress days so as not to overstress the organism when it should be recovering. The high should be high and the low needs to be low. Within the higher intensity days, exercises of each training variable are grouped in terms of distance, ground contact time, plane of movement, rhythm, and technical commonality among others. For example, acceleration work may be paired with horizontal plyometrics, or maximum velocity speed development paired with quick, elastic and vertical plyometrics such as depth jumps. Finally, he warns to always monitor power output. If power output falls, a coach should recognize and adjust distances, repetitions, or rest periods to accommodate high quality work. Greg Gatz’s presentation on training modifications for sports with multiple competition periods is like the strength and conditioning coach’s version of A Christmas Carol. 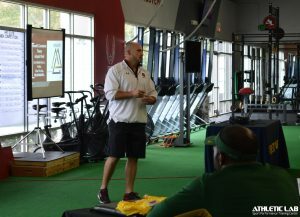 Throughout, he speaks of the past, present and future challenges that strength coaches have faced or are going to face. When speaking of past situations he has dealt with as a coach, Gatz highlights challenges or mistakes he himself has had to deal with. They ranged from having very little help in terms of assistants, a small area in which to run the workouts with all UNC’s athletes sharing the same facility, and basically running identical programs for each athlete regardless of sport. The challenges of the present include working with athletes who can technically perform amazing feats when participating in their sport but, when brought to the weight room, struggle to perform a squat. Along with this, the strength coach is negotiating with the head coach over having time with the athletes, sometimes having as little as 17 weeks over the course of the year to work with the athletes. Obviously this is an uphill struggle that requires the strength coach to compromise with the head coach to embed workouts in practice, thus taking the workouts to the athletes in order to ensure they are prepared physically to perform up to their technical skill level and help avoid injuries. The future strength coach will still have to manage to find ways to keep the athletes prepared throughout the year, even as sports like soccer and baseball shift to more year-round activities. One strategy to accomplish this might include further stressing the importance of off-season workouts when the athletes are not present on campus. Alex Carnall, the first of the Future Leaders Program participants to speak, and spoke about his recent experience with the Campbell University soccer team. This particular team underwent huge changes due to a vast majority of the team either graduating or being cut. Because of these wholesale changes in personnel, this led Carnall to experiment with a more simplified and basic strength program for the team. As it turned out, the simplification provided the team with solid gains. This is an example of the fact that just because we have a lot of advance training techniques, they may not always be the most appropriate choice. An analogy might be that if you were to bring a new car to a mechanic, they could rebuild your engine, when but all it needs is an oil change. “Fat don’t fly”, Dr. Mike Young addressed during his talk, if there is body mass that is not directly beneficial to propulsion it will actually “Fat don’t fly”, Dr. Mike Young addressed during his talk, if there is body mass that is not directly beneficial to propulsion it will actually be detrimental to your speed. However, it’s not just what you’re made of it’s how you use it; and at the end of the day there is only one guarantee to running faster simply, apply more individualized force into the ground in the right direction. But what direction? While in the past horizontal and vertical forces were seen as opposites, now they are considered interdisciplinary. Training one without the other could show improvements but when the elite track athletes are traveling at about 12.8 m/s you need every millisecond you can get. Going forward, having all the force in the world cannot compensate for poor posture. It is essentially like having a boat without a rudder, while the boat can move very quickly it is pointless unless it is moving towards it’s destination. The more powerful the athlete in a direction the faster they will move in that direction. Therefore, it has also been proven to be beneficial to add resistance training to their programs. 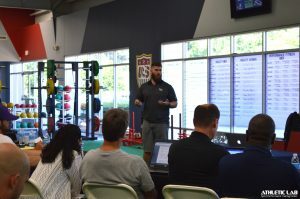 Dr. Young highlighted a variety of exercises including squats, kettlebell training, and plyometrics as ways to increase not only strength but speed through creating a more powerful athlete. In whole, to create the elite power and speed athlete it comes from training a multitude of variables. The athlete must be strong and powerful, but they also must have proper running mechanics and posture. To train all of these areas the athlete can then move faster in the desired direction. Your athlete breaks up with their significant other, gets a new puppy, or recently had a death in the family, these things and many others Coach Chad Workman has stated can vastly alter an athlete’s performance for the day. However, they are often overlooked as the coaches are focused in on the athlete’s physical attributes or skills, but with the affect they can have it is heavily beneficial to note these and adapt to these each and every training day. Although it looks like a daunting task to get gather all the outside, it can come by simply talking to them. By conversing with them and asking them how they’re doing can further create the rapport between you and them while also giving you the chance to potentially scale for them. The benefits of simply asking someone a question are far overlooked. One-way Chad spoke about when beginning the season to build a connection between you and the team is to ask them what THEY want out of the season. This can show that you want their input and create a way for them to want to work for you. 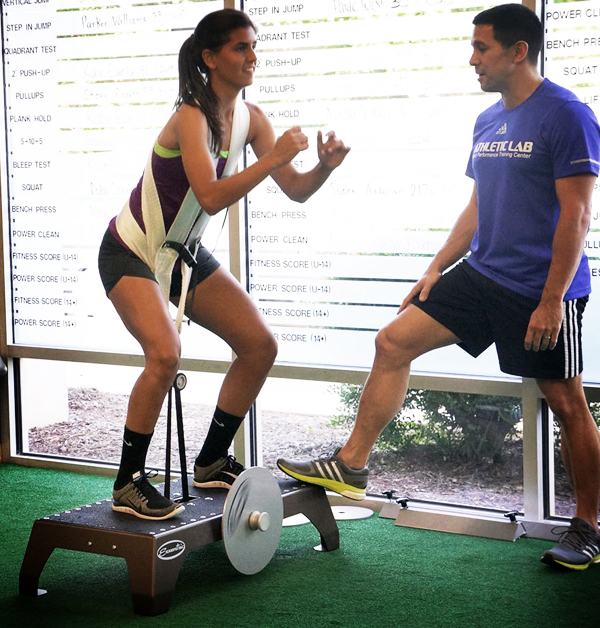 When it comes to athletes creating a rapport and relationship with them can grossly benefit you in the long run with their training, programming and results. Logistically, speed training is not hard to implement since as Coach Schexnayder says all you need is a place to sprint and a plan. However, one of the most common issues with speed training design is not making speed training a priority. This requires a good bit of patience due to the level of detail required to ensure you are following the proper protocols of training for speed. In order to ensure that you are in fact training for speed, there are three basic rules to follow. First is that you must focus on the quality of work; in order to train for speed, each rep must be as intense as possible. If you are running 40m sprints and the athlete slows down after 20m, change the drill to a 20m sprint and adjust the remaining workout accordingly. Second, there needs to be adequate rest. If the athlete is tired before they start a particular repetition, then they will not be able to perform it at the maximal intensity required. Third, speed training should have a lower volume of work. Running maximally is a neurally intense workout, therefore the volume must be low so the athlete can maintain a high level of intensity and avoid overtaxing the nervous system. It is important not to confuse speed work with conditioning drills. Speed training is not something you can fix as you move further along into the season, because as you progress into the season the athletes have increased demands on the body due to practices and games. This makes it difficult to work at the volume or intensity demands that speed training requires. In his talk about athlete monitoring, Coach Horn wanted to emphasize that first and foremost he was a coach and not a scientist. So when a lot of coaches look at sports science as being something they can’t do so they won’t do he wants to remind them that it won’t make them any less of a coach, it will actually make them a much more informed coach. Therefore if you have an athlete coming back from an injury and there’s a gap from therapy to full performance you can have a better grasp on where the athlete is in their return. Step one of sports science comes from not taking data just to take data, Horn makes sure to reiterate that you want actionable data. When it comes to technology you want to “aim small miss small” don’t blindly purchase things that you don’t know how to operate based on the idea of getting broad data, get items that you can get the information you need from. Also, when it comes to testing you need compliancy Horn prefers non-invasive testing, and doing on site testing because then he can control variables better and will get athletes more likely to participate. So when it comes to athlete monitoring you need to know your technology and know your data. Regardless of the sport, athlete monitoring should be used in every program. Brookreson goes on to add that it’s not just about getting more and more data it’s about getting the context behind the data it’s not just the number but what the number means in terms of performance in relation to the athlete. Then going further into data and talking about how frequently you’re collecting data can really make a difference on what it means. Therefore, if a coach is just taking data on testing days then he is missing out on all the important daily data which can be indicative of potential injury markers. In whole, collecting data is not nearly as important as what you do with it and just because you don’t consider yourself a sports scientist does not mean that you can’t use data benefit your program. 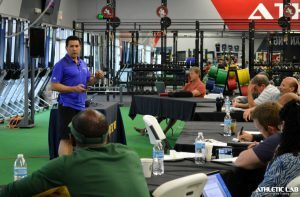 Coach Schexnayder’s talk on periodization of strength training for speed and power relies on two types of workouts: eliciting an endocrine response and developing neuromuscular efficiency.The workouts used to elicit activation of the endocrine system tend to be circuit workouts with sets of 10 with a mild stress on the last rep. This causes the body to release HGH and other important hormones, without adding excessive stress to the nervous system. Overworking the nervous system can lead to overtraining syndrome. You can mix and match the type of workouts you do, however, it is important to allow for the nervous system to recover. After an extremely taxing workout on the nervous system, it can be best to have the next day focusing on getting this endocrine response to elicit recovery. The workouts used to develop neuromuscular efficiency will concentrate on moving the bar as fast as possible (power) or moving as much weight (strength) as possible. Developing neuromuscular efficiency is important because muscles don’t contract on their own. In order to create high levels of strength and power, it requires communication from the nervous system to the muscles in order for the motor unit to function as efficiently as possible. Overall, a program design should be balanced. An often overlooked aspect to program creation is how crucial the balance between deloading (rest) and stress is. It is important to remember that deloading the athlete is what allows you to overreach to produce the desired stress response. This is because overreaching without rest leads to overtraining. Once the athlete has become overtrained, performance ability often decreases below their baseline. Reversing the trend is challenging due to the time constraints athletes have to operate under. Another way to consider balance is by observing the proper ratio of strength and power as it relates to sport. For example, a track and field athlete should aim for a ratio of 1:1:1.5 in the bench/clean/squat. This ratio could differ based on the needs of the athlete’s specific sport. 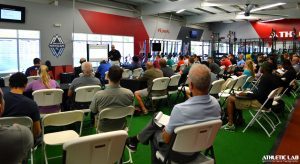 The biggest take-away from this talk was the need to establish a base level of power prior to focusing on developing strength. The reason behind this is that the power training allow for neuromuscular integration with the muscles, which in turn can lead to faster strength gains. While Coach Schexnayder considers all plyometric activity to be of high ‘neural’ demand, he goes further to group them based on intensity and similarity. In order of increasing intensity, the classifications include lower leg conditioning, in-place jumps, short horizontal bounds, vertical bounds, long horizontal bounds, and depth jumps. From a periodization standpoint, simpler and less intense plyometrics are used early on in the program to achieve a desired volume of foot contacts. As the program progresses, the volume drops in exchange for higher intensities. To ensure proper and consistent loading, a subjective plyometric index is employed. Each classification of plyometric activity is given an intensity rating 1-5. That number is multiplied by total foot contacts to give an index value that stays consistent throughout the program due to a balance between volume and intensity. This system, coupled with a coaches monitoring ability, ensures the absence of over-training since, as Boo says, elasticity in the muscle-tendon structure is the first thing to be hindered in an over-trained individual. A good coaching eye should be able to see a drop in an athlete’s elastic ability relative to their normal. Lastly, since plyometric loading cannot be adjusted by percentages of maximal weight like strength movements, exercise selection is the most important factor when periodizing a yearly program. Coach Alejo starts by recognizing that the job of a sport performance coach is simple at its core; to measure biophysical effects of training and manage training load accordingly. With that said, he notes that testing must be valid, reliable, and ultimately used in the process of programming. “If test data is not used in programming, you’re guessing.” The training methods, however, need not be terribly complex if certain training principles are understood. One such principle involves setting up the training plan in a way that recognizes the demand of the athletic calendar. As an example, Division 1 basketball athletes play so often and therefore jump so often that extra plyometric activity may not be necessary in significant volume. Rather, it may be more beneficial to simply prepare an athlete for the demands of their sport through consistent strength protocols. Additionally, Coach Alejo generally follows alternating intensity principles to maximize the effect of a given training parameter. During a phase of heavy squatting, intensities on other compound multi-joint exercises will need to decrease to allow the most energy to be put into the squat. The same is true for periods of increased sprint, plyometric, conditioning, and even play activities. There are so many different types of circuits you should be able to utilize them multiple times in your training progressions. One of the many benefits that circuits offer is that they are easily scaleable, and if one round of circuits becomes too easy for the athlete as they progress you can either increase the intensity or increase the difficulty of the movements. In order to make sure the intensity is kept high Schexnayder advises to keep the circuit to about 10-12 minutes, working to rest in a 2 to 1 ratio at about 15-30 seconds per interval.. Therefore when the athlete progresses they should be able to fill the time with more reps. The circuits can differentiate also in what they are training and how they are training. They can be used in a bunched format in which you will target one area in sequential intervals or through a rotational format in which you are targeting different areas in sequential intervals. When using circuits you also want to build your exercises, each exercise should be affected by the one before it. Then through the circuit the athlete’s body should be utilizing its muscles to work over the muscles it used previously. Schexnayder’s biggest take home point was that regardless of the style, the circuit should never be easy. Athlete monitoring isn’t a new technology it’s an old technology rediscovered, and when used correctly can be very effective. First off you have to know what you’re looking for, Coach John Grace made 4 co-mingling categories: internal, external, subjective, and objective. As an example of internal and subjective testing he uses a wellness survey, and it’s often overlooked to simply use pen and paper. It does begin to create some compliance issues but Grace has found that if you keep it to about 1 minute per athlete and do it in person the validity of the results will be higher. Further, the data you collect one day has the chance to be effective but for quality trends you will need to look at many sets of data over a span of time. Again though collecting data just to collect data won’t be effective, you need to have actionable data that can be presented to the coaching staff. 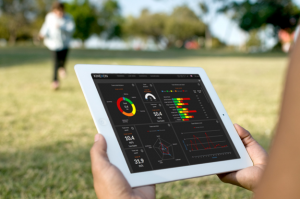 So you will need to take the data you’ve collected over time and show what the information means to the athlete’s performance. 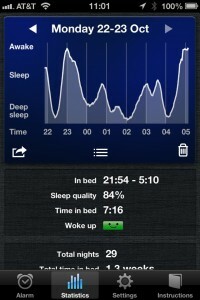 You should find out what you want to know, test and monitor for it, and then be able to use the data. Running originates in the core, making posture — or maintaining head and pelvic alignment — key. A common misconception is that posture not malleable when in fact it is a skill that can be taught and corrected. In fact, Coach Schexnayder described the Gait Triangle, which is made up of elastic energy, stability preservation and postural maintenance, and emphasized the importance of these factors in coaching sprinting. These three components are all interconnected so, if one of these is compromised, the other two will be negatively affected. The interactions between the components of the Gait Triangle are relevant to the three parts to teaching sprinting — the start, acceleration and max velocity — because all three components are incorporated into each phase. The start is important because it gets your body in position to apply force in the right direction in order to develop momentum so you can sprint faster. Keys to look for during the start are that most, but not all, of the weight is in the front foot; the body is folded with the hips slightly higher than the shoulders; and, lastly, that the shins are tilted forward. Shin angle is extremely important because if an athlete has false steps, it is usually due to improper shin angle. At the start of any sprint, you want slightly longer ground contact time, in order to invest the most energy into the ground while accelerating. This is to allow for building momentum so you can propel yourself faster. To achieve proper sprinting technique as you move to the maximal velocity stage, ground contact times will be shorter. This emphasizes the importance of creating momentum during the acceleration stage, because you will have less time to develop force. As you move from the start to acceleration, a key emphasis is to prevent the head and back from coming upright too quickly. Otherwise, the athlete will run with an anterior pelvic tilt, which negatively impacts performance. When teaching sprinting, it is important to attend to all three aspects of sprinting and their intersection with the components of the Gait Triangle. Coach Scruggs brought together multiple perspectives toward a common theme of practical athlete development. A nice visual piece was shown of a triangle with the two bottom corners representing environment and task, and the peak representing the athlete. The point of the triangle is to show that as a coach, you control the task and the environment in order to manipulate the athlete. Controlling the environment includes building relationships, culture, and compliance. The task refers to the actual training program. When controlling the task, Keith looks for his athletes to be working toward, or meeting, his critical conditions for adaptation. If an athlete has met acceptable adaptation standards, variation can be added to the program. What he calls planned variability is not only used on a yearly or monthly basis, but can be as simple as day-to-day changes in warm up movements, range of motion, speed of execution, etc. “Periodization was meant to be variable,” he says, “It is not strict, but it is not random.” Using a daily subjective gauge of adaptation allows us to continually analyze and prescribe what is appropriate for the desired outcome. Dr. Mike Young begins by speaking generally about all athletes who require speed, stating that their common denominator is the necessity of power output and that force production is the primary manageable variable. In terms of the muscular system, if we recognize the 5 main physical capacities for speed and power to be strength, speed, endurance, flexibility, and coordination, one of the above can account for all others. Every relevant quality of speed and power is, to an extent, a result of neuromuscular coordination. With this information in mind, Dr. Young shows a graphic of a continuum illustrating maximal strength at the far left and speed at the far right. While there is interplay between the two, the qualities they posses are nearly opposite. Somewhere in the middle, however, is what is referred to as low-end power. Training generally for low-end power moves you closer to the maximal strength-left, while training with more specificity moves you toward the speed-right. To clarify, general low-end power development includes resistance training with weights, slow sled pushes, short jumps, and multi-throws. Specific low-end power development is geared more toward running and includes hill sprints, resisted sprints, and accelerations. The same concept can be applied when moving toward the right end of the continuum to train for qualities such as elasticity and maximal velocity. The idea would be to move from general to specific loading within each quality. The practicality of this principle becomes apparent when initially developing a program for the speed-power athlete. Earl Wilcox is a graduate from the Kinesiology program at the University of North Carolina at Greensboro. Earl is currently possesses his CSCS from the NSCA and is an Applied Sports Science Intern at Athletic Lab. Greg Gustin holds a Master’s degree in Health and Fitness from the University of Pittsburgh and is CSCS certified through the NSCA. Greg is participating in the coaching mentorship program at Athletic Lab. Lindsey St. Hilaire is an Exercise Science major and psychology minor at Auburn University, and is currently an Athletic Development Intern at Athletic Lab.